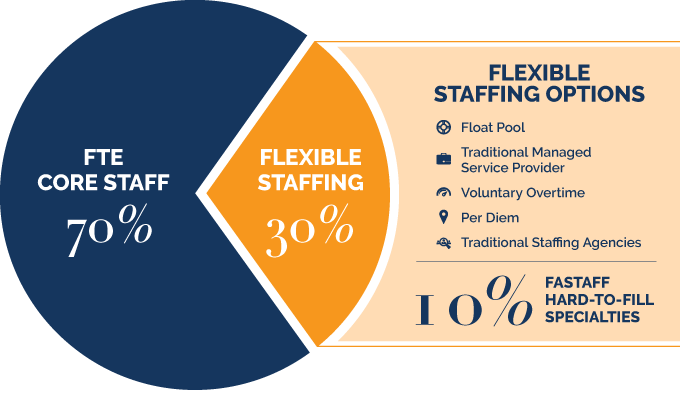 When flexible staffing options remain chronically unfilled, typically up to 30% of a staffing mix, trust Fastaff for your urgent and crucial hard-to-fill staffing needs. As the pioneer and industry leader in Rapid Response® travel nurse staffing solutions, Fastaff guarantees delivery of experienced nurses, often in 10 days or less. Our deep database of nurses consists of more than half in a hard-to-fill specialty, guaranteeing critical coverage for your most intense units. Often packed and ready to depart, Fastaff RNs are recognized in the travel nurse industry as experienced, adaptable and ready to hit the ground running. Fastaff provides operational flexibility with flexible-length assignments, as short as two weeks, resulting in lower total cost. Trust Fastaff to manage your chronically unfilled positions for a complete staffing strategy, ensuring uninterrupted quality patient care.